Joy: to rejoice: to feel cheerfulness. Oh! To have a humble heart, a humble mind, and a humble demeanor gets rewarded with eternal salvation. God celebrates and takes joy in this. 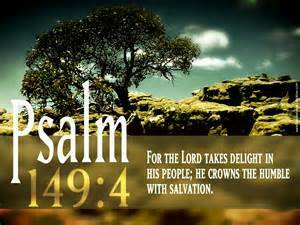 The highest reward a Christian can receive is the crown of salvation. A crown that gives 24-hour access to God. It removes the scales that covered our eyes and ears. It allows us to see the Kingdom of God, hear God’s Word, and understand the mystery of salvation. Categories: god, humble | Tags: Christ, christian, christianity, God, Jesus, Kingship and kingdom of God, Psalms, Son of man (Christianity) | Permalink.